367 Simon, H.A. (1972). The sizes of things. In J.M. Tanur, F. Mosteller, W.H. Kruskal, E.L. Lehmann, R.F. Link, R.S. Pieters, and G.R. Rising (Eds. 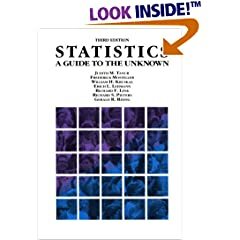 ), Statistics: A guide to the unknown (pp. 195-202). San Francisco: Holden-Day. Published by Duxbury Press in partnership with the American Statisical Association, 2005. Statistics in the Courtroom: United States vs. Kristen Gilbert. The Anatomy of a Pre-Election Poll. Counting and Apportionment: Foundations of America's Democracy. Evaluating School Choice Programs. Designing National Health Care Surveys. Monitoring Tiger Prey Abundance. Predicting the Africanized Bee Invasion of the United States. Statistics and the War on Spam. Should You Measure Your Home's Radon Concentration? Statistical Weather Forecasting. Space Debris: Yet Another Environmental Problem. Modeling an Outbreak of Anthrax. The Last Front—Understanding the Human Mind. Leveraging Chance in HIV Research. Statistical Genetics: Associating Genotypic Differences with Measurable Outcomes. DNA Fingerprinting. How Many Genes? 4. BUSINESS AND INDUSTRY. 3. BIOLOGY AND MEDICINE. Baseball Decision Making by the Numbers. Predicting the Quality and Price of Bordeaux Wines.